Mira is a digital signage platform which enables users to bring news, menus, promotions, social media, and more to any TV screen using features such as drag-and-drop image and video upload, major file type support and flexible scheduling tools. Businesses use Mira to enhance sales, improve guest experiences and engage employees. Users can increase employee engagement for back-of-house by using the digital signage platform to display announcements, opening and closing procedures, as well as shift schedules and interactive teleconferencing and training. Mira’s straightforward tools enable users to manage digital signage without help from a designer. Mira works in a few simple steps. First users connect their MiraLink to the HDMI port of any TV in order to connect all of their screens to the internet, then they log into their Mira dashboard to create and publish content. The online dashboard enables users to upload and drag and drop content, then schedule it to be displayed across multiple screens. Mira supports dynamic apps which allow users to display content such as news or calendars automatically on their screens. Mira can be utilized by a range of industries including bars and restaurants, hospitality, workplaces, retail, gyms and recreation, and healthcare to show specials boards, event calendars, weather forecasts, services, birthday and welcome messages, and more. MIRA highlights my business when I'm not there to do it in person. My business shares space with a movie theater. As moviegoers stand in line for tickets or concessions, MIRA piques interest and provides information about my business with an audience of potential customers, that may not be exposed to my business otherwise.I love the ability to manage my MIRA signage from anywhere... at work, from my couch, on vacation. Keeping my posts fresh keeps my patrons current on what's happening in my business, including operating hours (especially during holiday and school vacation periods), our current escape room themes, promotional programs and the weather. We even have a trivia slide that keeps onlookers' interest throughout the entire loop. I love the ability to manage my MIRA signage from anywhere... at work, from my couch, on vacation. Keeping my posts fresh keeps my patrons current on what's happening in my business, including operating hours (especially during holiday and school vacation periods), our current escape room themes, promotional programs and the weather. We even have a trivia slide that keeps onlookers' interest throughout the entire loop. I wish some of the templates were a bit easier to customize. I use the Presentation template to display my operating hours. It work for the most part, but a template specifically for hours would be great. Random loop freezing or skipping, not due to internet connectivity, occurs. If it occurs during off hours, I have no way of telling, therefore no way of rebooting the connections, or in my case, republishing. I wish there was an option for trouble notifications of some sort. We use Mira to engage with our guests and stores on a more personal level. With the proper equipment, we are able to 'facetime' with our guests during an event or on any occasions that we see fit. And of course, its core digital signage functionality is a great in-store communication channel that can push any promotional messages almost instantly.It can display digital menus, promotional ads, video messages, youtube videos and offer a variety of capabilities. What makes it stand out is its video conferencing capability - it's like facetime but when it is used in a commercial setting with the ability to broadcast to multiple locations at the same time through TVs, it is veryinnovative. The management/service team is responsive, reliable, and great to work with. 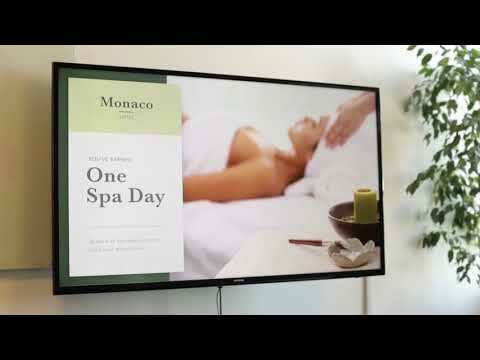 It can display digital menus, promotional ads, video messages, youtube videos and offer a variety of capabilities. What makes it stand out is its video conferencing capability - it's like facetime but when it is used in a commercial setting with the ability to broadcast to multiple locations at the same time through TVs, it is veryinnovative. The management/service team is responsive, reliable, and great to work with. Video conferencing requires the user to facilitate the process and turn on the equipment. If everything can be automated with 1 single tab that will be incredible. We had a few issues initially with the software locking up on certain screens and we had to reset the device or Mira had to reset the software for us. However, things seem to be error free and performing as expected ever since. Mira allows us to create presentations for customers that give us the opportunity to let them know about events, offerings, specials, and other items. Not only do we use it to show menus, but also ask for reviews and advertise our Wine Club. Since we have started using Mira we have been able to stop printing menus which saves money on paper, we have nearly doubled our Wine Club membership, and have gotten many new positive reviews on multiple platforms.Mira allows us to keep important information in front of our customers via the TV we already have installed in the tasting room. Mira allows us to keep important information in front of our customers via the TV we already have installed in the tasting room. There is not much to dislike. Mira is adding functionality all the time. Mira review - how it works for me. It's been a great addition to our marketing efforts from within the store. Our locations are very busy and it's not always that easy for our customer service specialist to mention current promos. We rely on Mira to assist in this area greatly.The set up process was very easy and fast. The support team was great as well. The set up process was very easy and fast. The support team was great as well. Nothing really that I didn't like, however, it'd be great if the implemented a kinetic typography module. • Use drag-and-drop upload tools to add images or video content to screens quickly and easily without help from a designer. • Mira enables users to control all of their screens anywhere, anytime via any internet-enabled device. • Flexible scheduling tools allow users to schedule one-time or recurring content to instantly override default playlists. • Mira offers dynamic apps which allow users to display content like news or calendars automatically. • Mira supports in-transit and at-rest encryption to ensure all content is managed safely and securely. Below are some frequently asked questions for Mira. Q. What type of pricing plans does Mira offer? Q. Who are the typical users of Mira? Q. What languages does Mira support? Q. Does Mira support mobile devices? Q. Does Mira offer an API? Yes, Mira has an API available for use. Q. What other apps does Mira integrate with? Q. What level of support does Mira offer?